Aside from that, however, there’s not a ton of information about this event. There’s no word on who will handle the artwork on the run, or even what the general storyline entails. Doctor’s Ten and Eleven have new travelling companions in their comics—Gabby Gonzales and Alice Obiefune respectively—and they will reportedly make an appearance, as will Capaldi’s current cohort, Clara Oswald. This isn’t the first time the three most recent Doctors have come together, as they briefly shared the screen in The Day of the Doctor, the 50th anniversary special. However, this will be a much more in depth, extensive interaction. We don’t know how they’ll frame this, but the series launches its initial volley on August 12 and will continue through September. 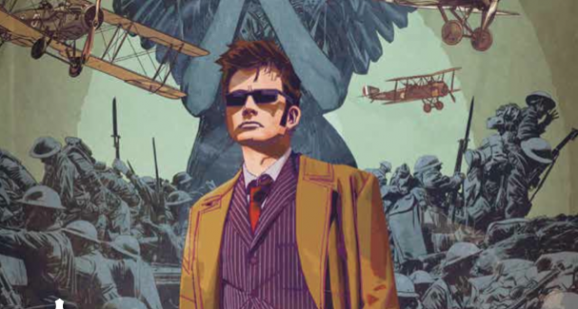 If you’ve been keeping up with our reviews, as it stands, The Tenth Doctor is far and away the high point of these continuing runs that Titan has going. The Twelfth Doctor is solid, and improving all the time as the youngest of the three. As far as storytelling quality goes, The Eleventh Doctor has been the weak link, and is all over the place. The other two have taken a longer form approach to the narrative, allowing stories to unfold over multiple issues, while this one has been more one-offs that feel compressed and truncated. It’s making strides, but it has a long way to go.